The Non-governmental Organization led service delivery model is considered to be cost effective, participatory, and accountable, thus services reach the intended beneficiaries. Increasingly literature has come to prove otherwise that the NGO-led service delivery is contradictory, instead NGOs implement donor agendas because of the high dependence on donor funds. This study examines NGO-led service delivery model amidst growing evidence and knowledge that this model may not adequately contribute to poverty reduction without government institutional support. The study found out that the NGO-led service delivery model is constrained by funding, political environment, governance and dynamic between NGOs and government. The need for the donor agencies to channel resources through NGOs does not only expose NGOs to donor dependence but puts the NGOs in a position of implementing donor agendas as evidenced in the study as NGOs struggle to be effective and accountable to the donor community. NGOs seem to be on crossroads to follow the social mission of delivering services or to engage in advocacy activities. By the mere fact that NGO funding, governance and relationship with government depends on the legal and administrative framework, increasingly NGOs have been constrained to deliver services contrary to the donor presumption. Whereas NGOs have caused some impact to on poverty reduction of individual farmers in Uganda, they cannot be relied on because they only focus on a small percentage of the poor, even in places with the highest number of NGOs high levels of poverty is still evident. Further, this paper highlights what the NGOs and beneficiaries do to counteract the constraints identified. I therefore contend that, NGOs alone as fronted by the donor agencies are not the best alternative to deliver poverty focused resources. We need strong NGOs and Government institutions interacting together in order to deliver services to the poor. 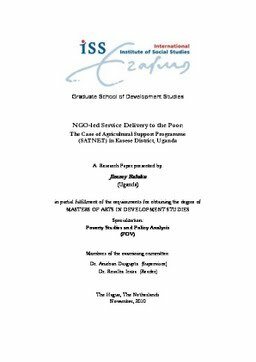 -- Relevance to Development Studies -- Poverty reduction is at the helm of development studies and service provision to the poor in developing countries. By service provision we mean, those agencies both government, private sector donor agencies and the NGOs that deliver poverty focused resources to the poor. The study on the NGO-led services delivery to the poor aims at examining how the NGOs are constrained in delivering agricultural services to the poor because of the political, governance, funding and participation issues both from within the NGO and external settings.